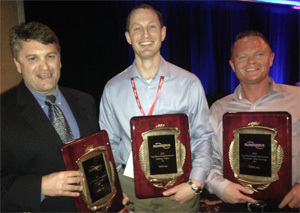 Duluth, MN: On April 20, 2014, GPM, Inc. attended the Flowserve Corporation (NYSE:FLS) distributor’s meeting in Jacksonville, Florida, where the Company received three awards recognizing GPM as one of the top distributors in the nation. “I am extremely proud of the entire GPM team and their hard work for making these three awards possible” stated Bob Gemuenden, GPM Vice President of Sales, Industrial Products and Solutions. “GPM has an accomplished distributor team with a high level of dedication to their products and winning these awards recognizes that; we couldn’t be happier,” continued Gemuenden. Flowserve is one of the world’s leading providers of fluid motion and control products and services. Operating in more than 50 countries, the company produces engineered and industrial pumps, seals and valves as well as a range of related flow management services. More information about Flowserve can be obtained by visiting the company’s Web site at www.flowserve.com.